I had a week off in June and decided to make the switch from pastels to oil paints. It has been a steep learning curve, no matter that I painted for a decade before we had a baby and I decided to use a less toxic medium. 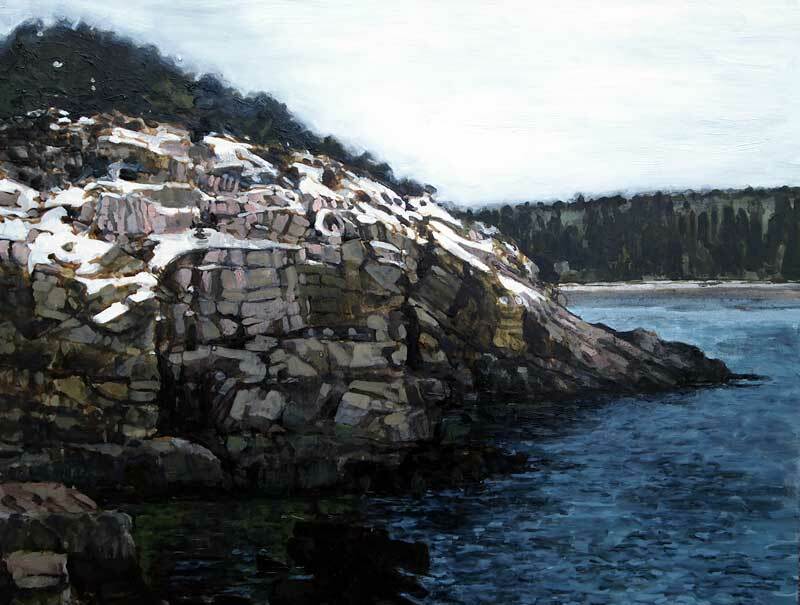 I’m working from sketches and photos from last winter of this site in Acadia National Park, 18″ x 24″, oil on board. This entry was posted in art, landscape, the backyard, work in progress and tagged landscape, painting, summer on September 5, 2012 by APo. Days 3 and 4: hiking trails that end at a 100′ drop, weird characters on the library keyboard, lemon cream blue berry pie, seals, Hole in the Wall, herring weirs, Fish Head, hiking trails that end abruptly at a 200′ drop, having Eel Brook Beach all to ourselves and the constant hum of the ferry, just off shore. 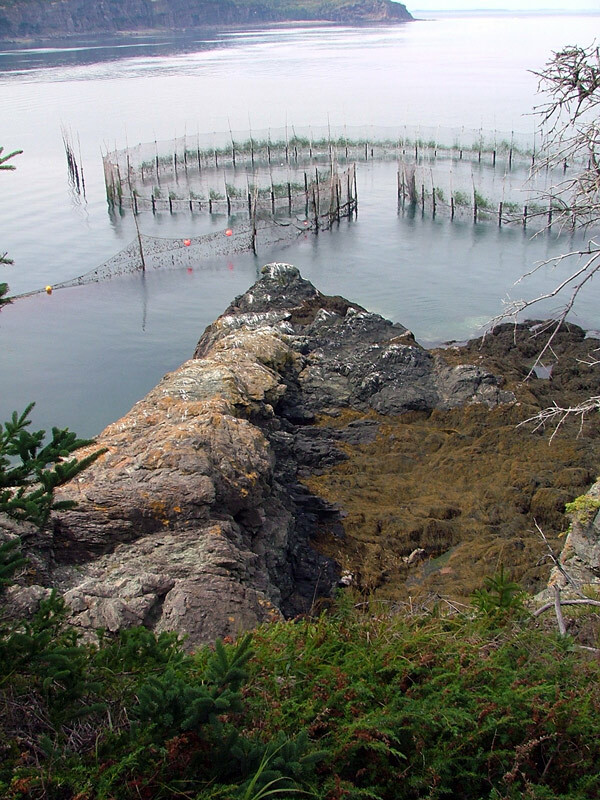 This entry was posted in Grand Manan, Travel and tagged landscape, ocean, summer on August 19, 2010 by APo. Today was a perfect day for a garden club tour; a bit of rain and clouds to discourage the casual observers but not enough wind to damage the white begonias, cool enough to walk energetically in a heavy skirt and sensible shoes, misty enough so that I didn’t regret forgetting my hat. 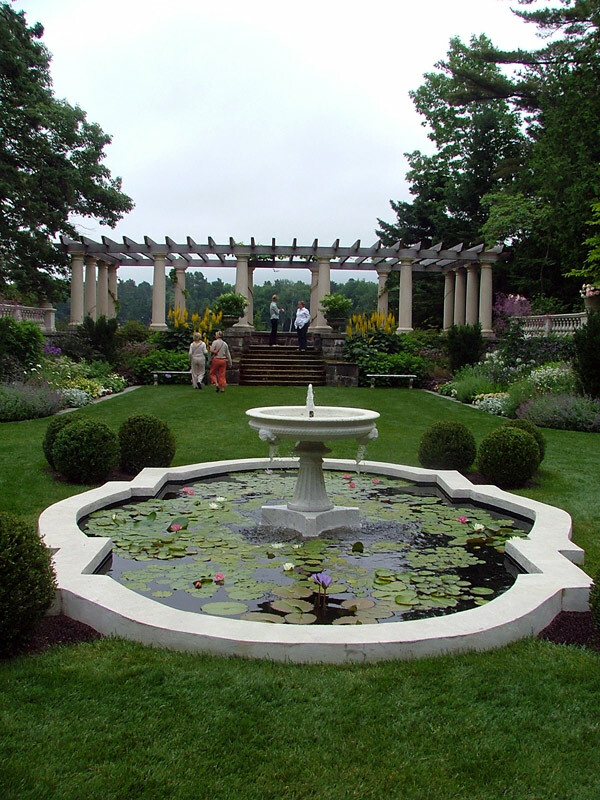 This particular garden had not previously been open to the public. 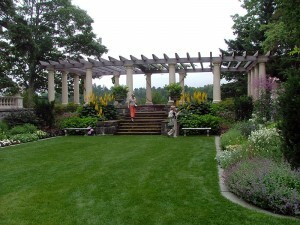 The cutting and kitchen gardens are visible through the wrought iron fence from the street, but it was wonderful to get up close and personal with the sunken Italianate formal garden, the mossy pergola that faces the cove, and some really lurid roses that were nevertheless enjoyable under the low, gray clouds. Oh, and the shingle style dog house with slate roof, dutch doors and window boxes was just the right touch of surreal. Artichokes – beautiful plants and evidently productive here. The head gardener went on at length about daylight and temperatures requirements for full maturity, but honestly I wouldn’t care if I didn’t get a whole lot of fruit – the plants were striking in themselves. Of course, he doesn’t have that luxury. Cold frames extraordinaire: I went over to look at some cold frames – 15′ x 2′ high on the short end, rising to 4′ and faced with glass panels. When I looked in to the frames, I realized that they had been excavated to a depth of 10′. There were ladders built into the walls at either end for access. With that much berming they must be very cozy even in early spring, and if I thought I could dig a hole 12′ deep on my lot I’d try it out. Smoke bush in bloom with Madonna lilies rising through the mist of blossoms – quite a striking effect. 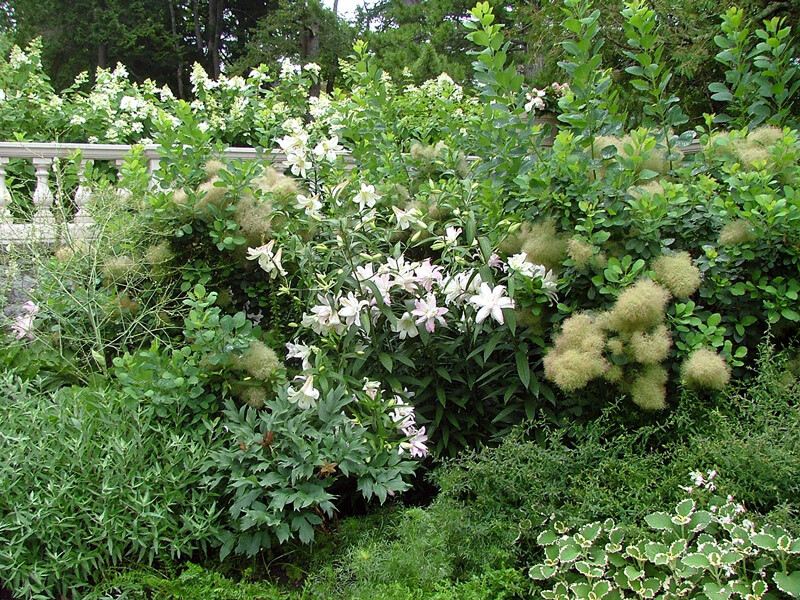 Datura was everywhere, and lent an exotic air to the otherwise common assortment of border flowers: ligularia, phlox, mulliens, begonias and thalictrum. This entry was posted in gardening, horticulture, the neighborhood and tagged architectural landscape, Bar Harbor, garden, landscape, perrenial on July 25, 2010 by APo. Bears all its sons away. Today I walked down our road and across the highway to the woods beyond, where Kittredge Brook winds down to Somes Sound. The place has unpleasant seasons; clouds of mosquitoes from Memorial Day to the Fourth of July, caked white mud and burnt grass in August, cold wet muck in October and featureless white for as long as there’s snow. March seems tolerable. 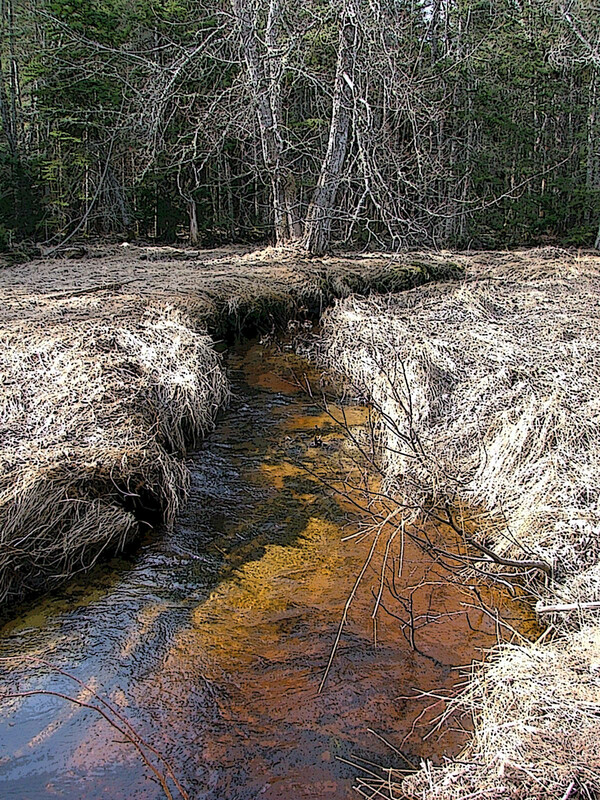 The muck was still mostly frozen under foot, the February flood has receded and the water is pure, showing off its orange tannin underbelly. 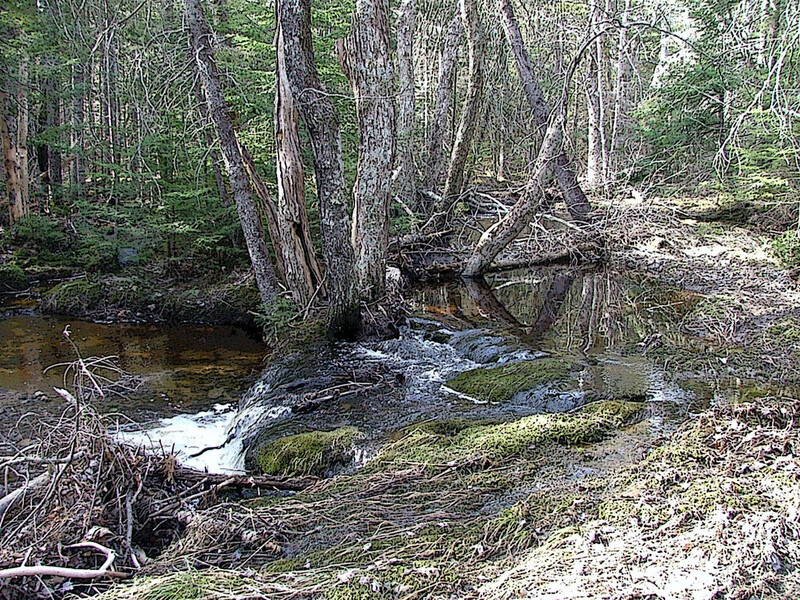 New England’s answer to howler monkeys, the pileated woodpeckers, were calling from the flood-dead maples, the deer I startled were fairly fat and sleek for this time of year, and something heavy splashed into the stream, but didn’t bother me. It was a good day. Rules for walking in the woods alone. Tell someone where you’re headed and approximately when you will be back, and then stick to the schedule. If no one is around, leave a note. I know it’s hard to fathom, but we don’t have cell phone reception here. If you’re not following a human trail, try to follow a deer track. Deer are stupid, but they do know the best way through the terrain. If the track veers off for no good reason, go right along with it. 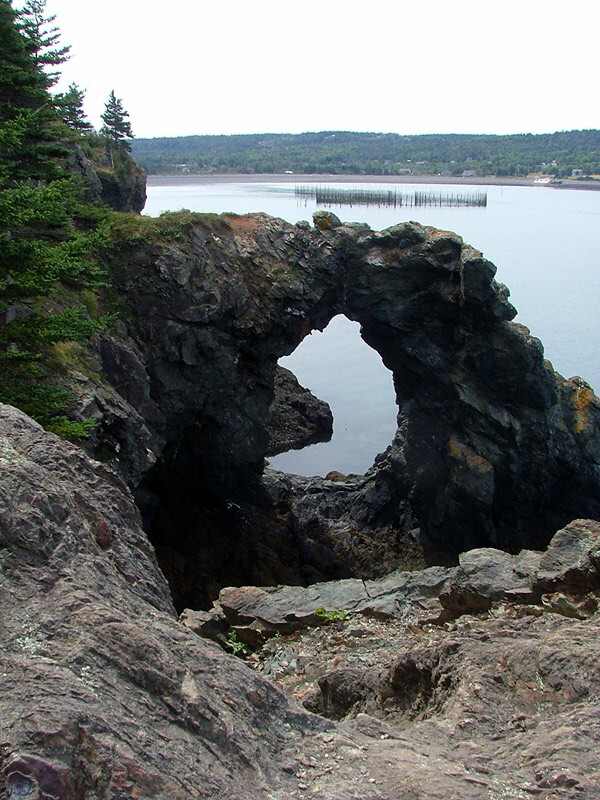 If you get wet, go home – preferably by the most public route possible, such as a road or snowmobile trail. You may still die of hypothermia, but this is your best shot at someone finding out what happened to you. Bring a hat. You’re warm now, and you’ll get warmer walking, but at some point you’ll need a hat. It is not necessarily paranoid to bring a few emergency items along. A whistle, a pack of matches and a flashlight aren’t going to slow you down that much. Don’t bring a compass if you don’t know how to use one because it’ll just make you mad when you get lost. If you have your camera (I always have a camera) and you see something interesting, stop and take a picture. No matter how well you re-trace your steps you will never see that thing again. I have no idea why. The verse above is from “Our God Our Help in Ages Past”, by Isaac Watts and was the hymn Winston Churchill chose for his funeral. This entry was posted in the neighborhood and tagged landscape, spring, winter on March 13, 2010 by APo. 30 knot winds tonight with driving rain and a flood warning until mid-day tomorrow. We’re expecting 20′ waves and the shore roads are closed to traffic. This is a big, slow moving storm and the ground is still frozen – water is streaming down our dirt road to make a muddy delta on the highway. Almost all of our snow has melted away, leaving the brown and gray landscape that will stay with us until greening begins in April. 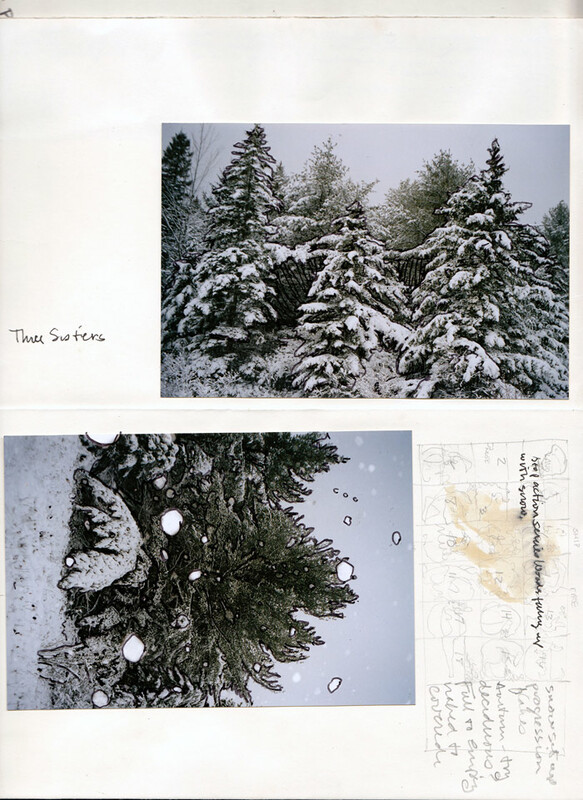 It’s a long time till April, so I’m posting pictures of the snow from my daily companion sketchbook. The landscape won’t look like that again until we come full circle around the sun. 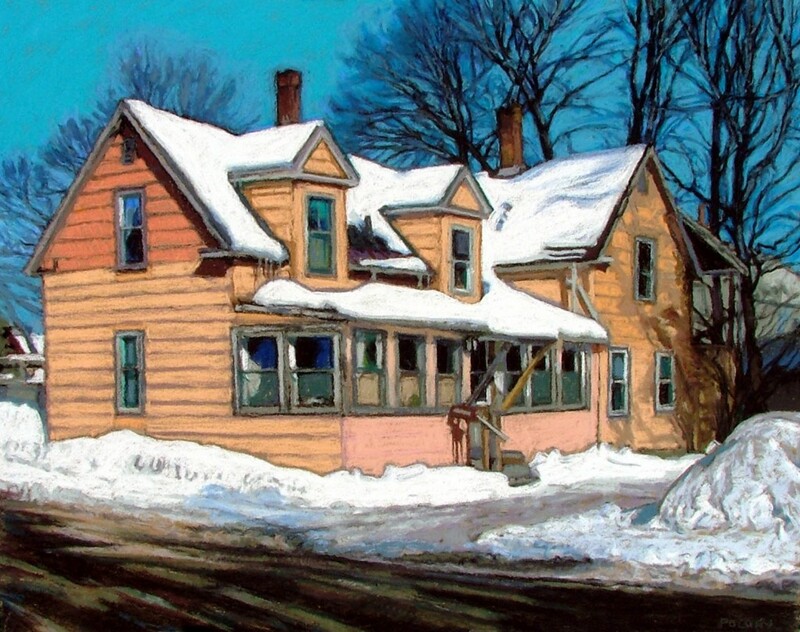 This entry was posted in art, landscape, the neighborhood and tagged landscape, weather, winter on February 25, 2010 by APo. This entry was posted in art, landscape, urban landscape and tagged architectural landscape, drawing, landscape, pastel, winter on February 6, 2010 by APo. 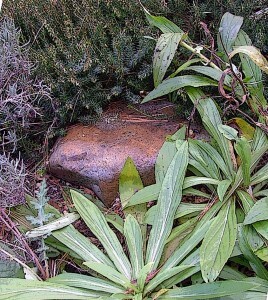 I have rocks scattered around the garden for the most banal of reasons – I need them to step on.Yesterday afternoon I was out in the alpines, cutting down stalks and seedheads, and noticed the rocks as a structural element once again. They are lovely peeping out between lush branches of myrhh or half covered with campanula, but they really come into their own when the fickle vegetation subsides under a frost. They also mitigate our harsh climate, parceling out the change from 10 degrees to 40 over the course of a January afternoon into smaller, gentler increments. Some of the rocks are spectacular specimens all on their own. . .
. . . and some are simply a sturdy, not unattractive place to put your foot while weeding. I found this beautiful pale upright while digging a carrot bed. It has taken a few years of wind and weather to expose its true colors. And this one, again, is just a stepping stone. Can you imagine my wooden clogs on that seedum carpet? No, you cannot. 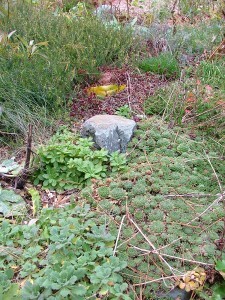 Heath and heather require top-notch drainage. 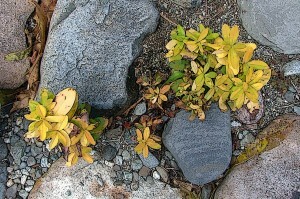 In this climate it’s not even the cold that kills these plants, it is wet roots and layers of clay. I dig a fairly deep hole (2′ for a 4″ pot) and fill it with large rocks and sand before planting a member of this family in a peaty hollow at the surface. My oldest plants have survived 15 winters here and thrived. 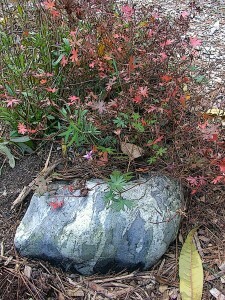 This rock isn’t really visible in the summer, hedged in by daylilies and Bouncing Bet. In this season it’s sculpture. 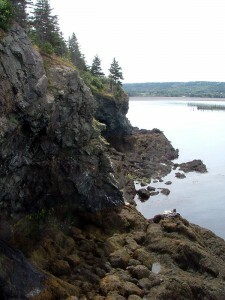 Winter is coming – the best time of year for collecting more rocks. I can hardly wait! 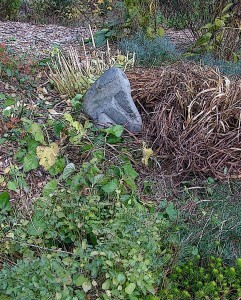 This entry was posted in gardening and tagged autumn, garden, landscape on November 2, 2009 by APo. This is a wonderful plant. It has an interesting shape in every season, the “nutlets” make a terrific cut flower and the deer don’t like it one bit. Below is the description from Fedco Trees, which is one of the only places I could find information on this lovely plant. 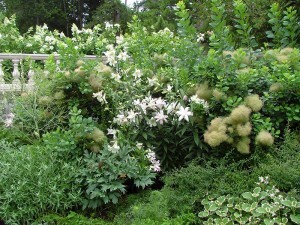 6-10′ x 8′ Loose rounded branchy shrub with bright green foliage and masses of highly attractive unusual spherical fragrant white flowers. Suitable for the garden, the stream or pond, or even an old floating log. Don’t be surprised if you come across buttonbush growing in the river next time you head out in the canoe. 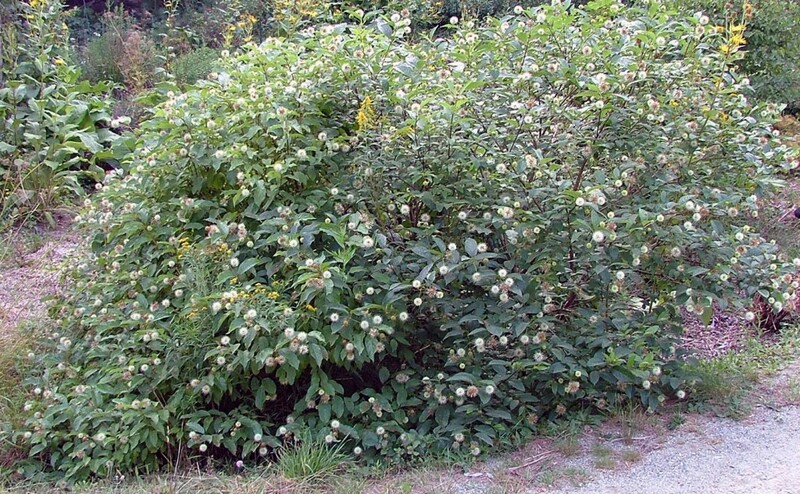 But this is no invasive plant. 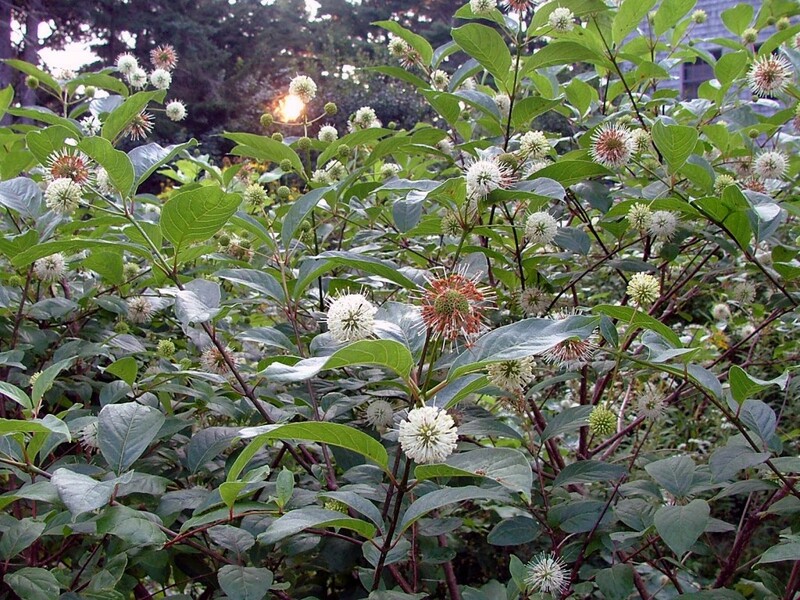 Flowers appear for 4-6 weeks in summer, a magnet for honey bees. They also make interesting dried flowers. The seeds (nutlets) make good fodder for the ducks in the fall. Prefers moist soils! Recommended for naturalizing. 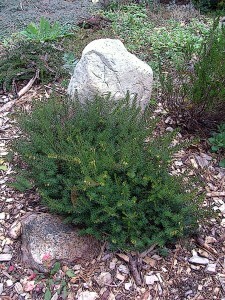 Native to eastern U.S., west to New Mexico. Z4. 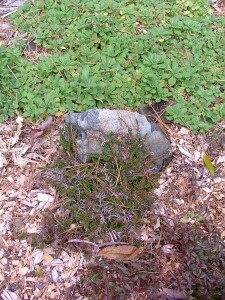 I haven’t tried growing it on a floating log, but it does very well in the culvert next to the driveway. This entry was posted in gardening and tagged bees, garden, landscape, perrenial, summer on August 18, 2009 by APo. 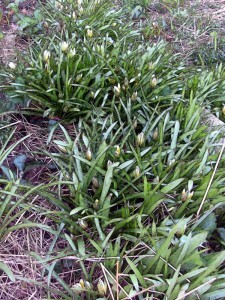 The species tulips are blooming along the south wall of the house. 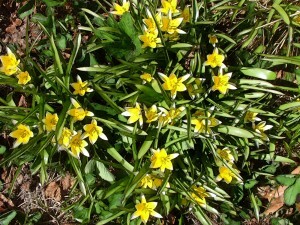 Originally from Crete, they flourish in the dry, sandy soil by the foundation and multiply furiously every year. They are completely care and pest free, even the deer don’t seem to favor them. The only down side is that they only bloom during the hours of direct sun. When I leave for work in the morning the blossoms are closed, pale pyramids against the green foliage – the same when I return home and the sun is gone from that side of the building. But today was Sunday, and I walked along the wall and admired the display. This entry was posted in gardening, horticulture and tagged garden, landscape, spring on April 26, 2009 by APo.